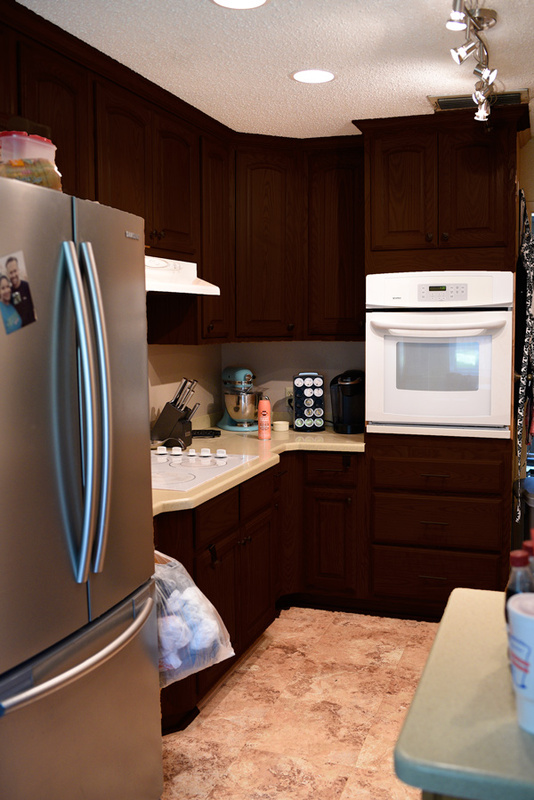 It is no secret that my most popular post of all time is my tutorial about transforming your oak cabinets into gorgeous, dark espresso colored cabinets. I am fairly confident the reason that 90% of you are even reading this is because of THAT tutorial, so I’m grateful and humbled you’re still reading. That being said, a lot of my traffic comes from people googling “Monica Wants It kitchen” because they want to see how my kitchen turned out after my initial inspiration post. Well, um…I’ve never gotten around to it because I was so indecisive! 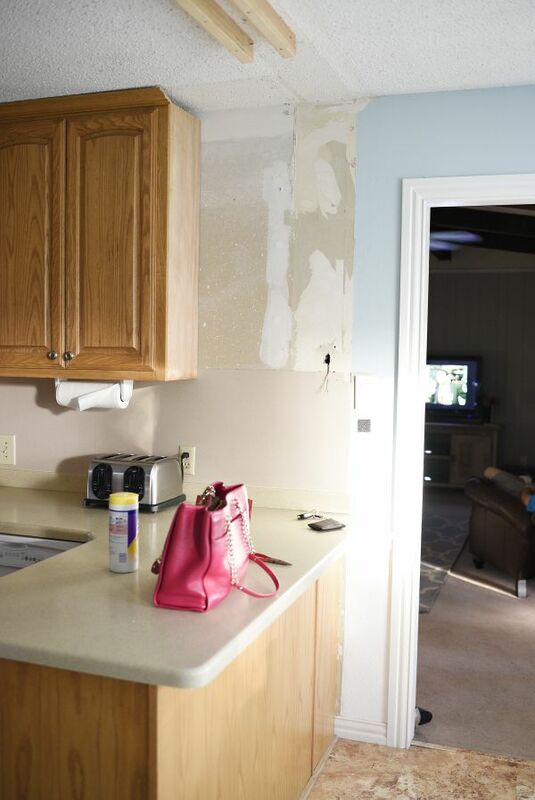 Well, I was indecisive until this past Saturday when we started renovating our kitchen! It was not planned, definitely a “whoops!” kind of thing, but I couldn’t be happier to have finally ripped off the band-aid. Here we have what I consider a functional space. No major issues in the photo above. On the other side, we have a similar L shaped area with the sink, dishwasher, etc. 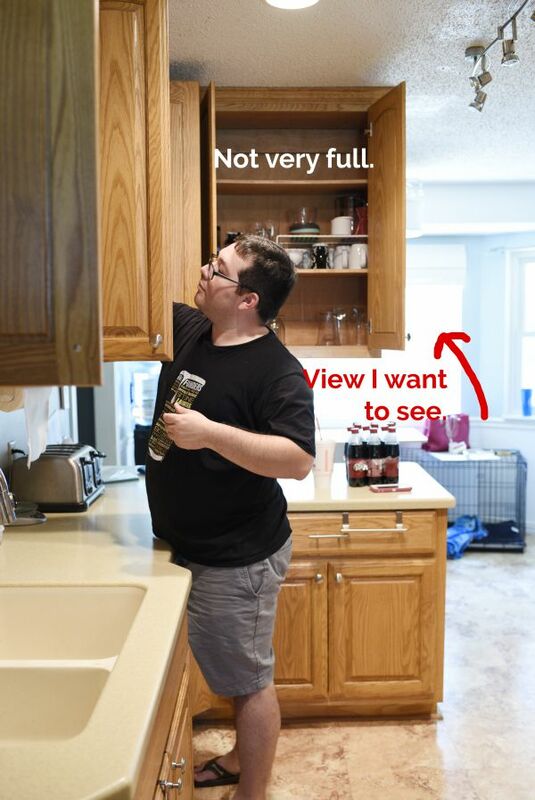 And we also have the biggest obstacle in the kitchen…those two ginormous cabinets that block my view to our backyard. I’ve been wanting them gone FOREVER to bring in more light and open feeling. 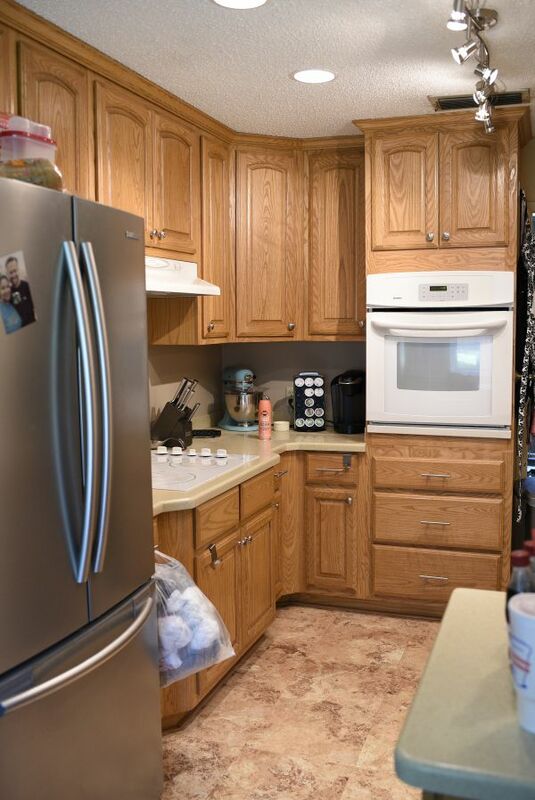 Plus, those huge cabinets make it nearly impossible to efficiently use that counter space, and if someone is standing on the opposite side, you can’t really talk to them. 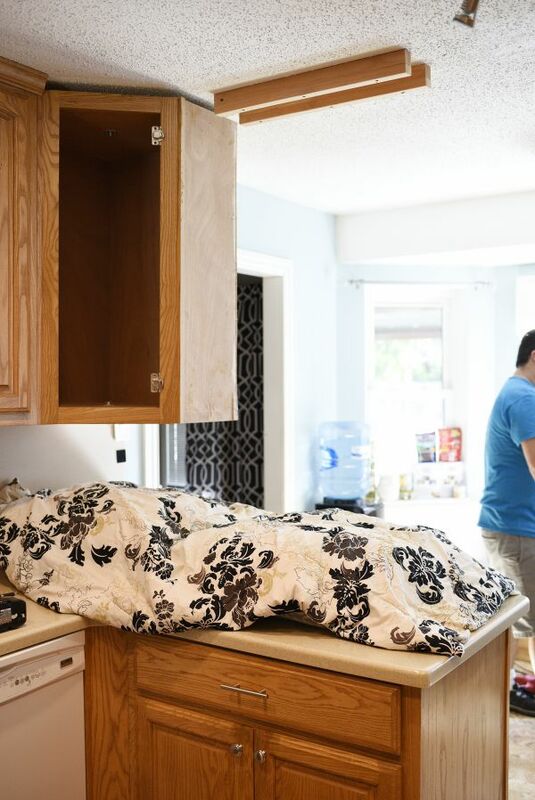 Another tricky part to the kitchen is that it has three entrances to contend with- the living room, the laundry/garage exit, and the dining room. Therefore, a major layout change is not feasible without investing MAJOR dollars. No thanks! So, back to those two cabinets. The corner one is a lazy susan that we use as a pantry. There’s one on the opposite side as well that was relatively empty. The other cabinet held glassware and mugs, but wasn’t full. Remember how I was talking about wanting to live simply and have less stuff? Yes? Ok, great. That’s why we decided to pare down our kitchen stuff and sacrifice two cabinets for the sake of an open feel and backyard views. We took the cabinets down! The items we housed in those two cabinets were easily relocated to other cabinets. We never use the third/top shelf, and now we will…as soon as we get a kitchen stool. We’ll put items we don’t need super often on the third shelf. In terms of resale, we don’t know if ridding of cabinet space will hurt us, but I’d like to think the open view and upgrades we’re planning will help. Right? It took Daniel and I about two hours to remove both cabinets because unlike those House Crasher shows we all know and love, I do not have a demo crew, dumpster and help to get all that stuff out if we were to just go nuts with a sledgehammer. 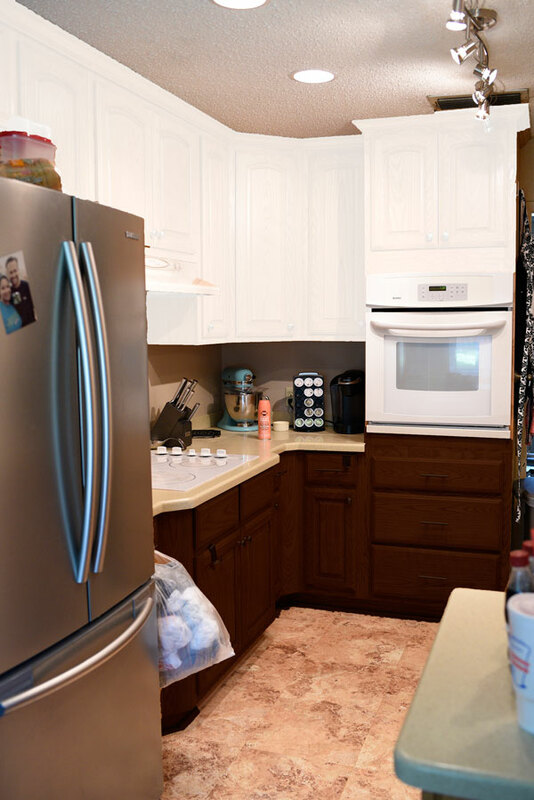 We very methodically and carefully removed the two cabinets to ensure hardly any clean-up and no damage to the cabinets we are keeping and countertops. 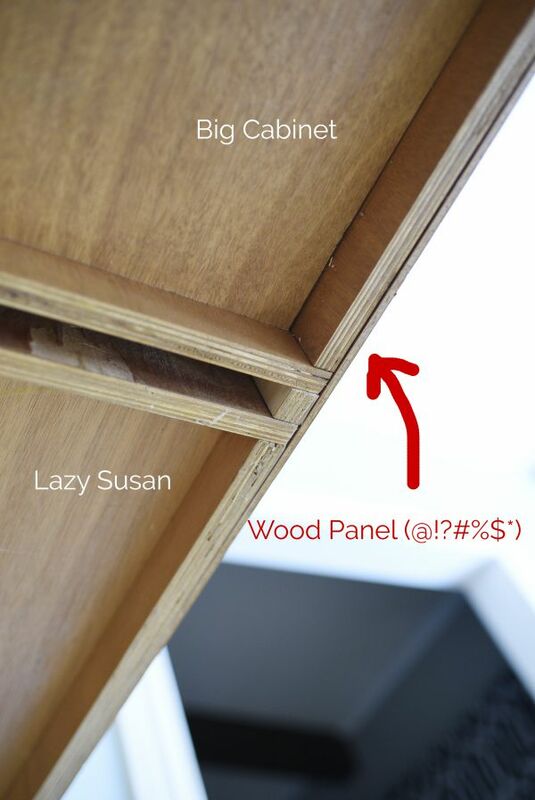 The two cabinets were “joined” together by a huge plywood panel thing (see pics below), so whipping out the reciprocating saw was a must in order to separate the cabinets and then take them down. One down, one to go. That HUGE cabinet was held up by some tiny strips of wood stacked together. All gone! Insert happy dance and subsequent fist pump here. Our cordless drill died before we could remove those strips, but they did eventually come down. The only major wish I have that I know will not come true is having an eat-around kind of island thing. There’s just not enough space (see below) to accommodate barstools without impeding the traffic flow to the living room. Boo. 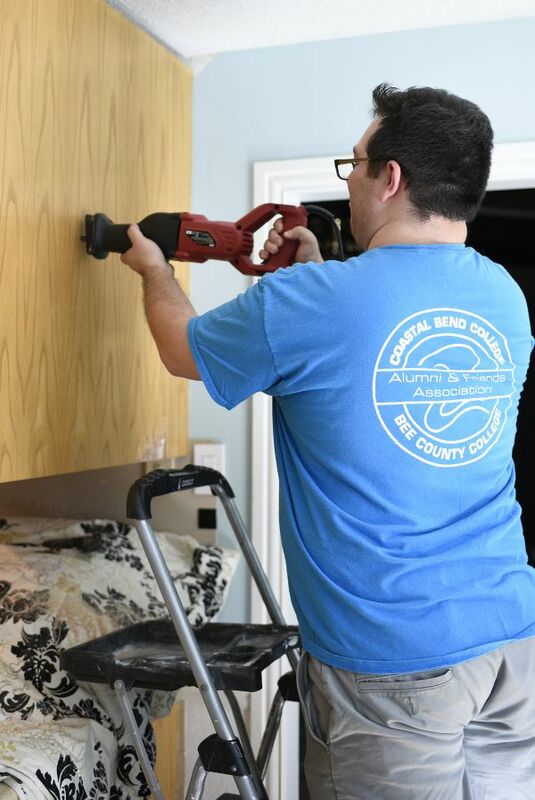 Up next… removing the popcorn ceiling. A full tutorial on this really isn’t needed because it is EASY. Make sure you don’t have asbestos in your ceiling, first and foremost. Proceed with a spray bottle and warm water– spray about 4×4 foot sections, wait 2-3 minutes, scrape and repeat. 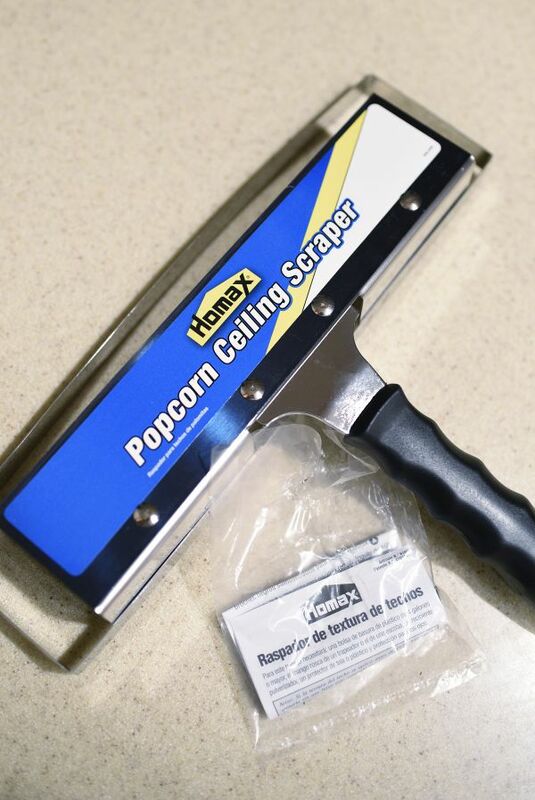 I used this popcorn ceiling scraper tool, which has very mixed reviews, but we loved it. It worked really well. We still had dust and such to clean-up, but overall this scraper + a 4-gallon bag took care of the dirty work. Our kitchen and breakfast nook took about 3 hours total, including prep and clean-up. And here’s what it looks like thus far. We have some areas to patch up the ceiling and then we’ll proceed to painting it and moving on. My biggest decision now is what color to paint/stain the cabinets. I adore white kitchens, BUT with all the wood grain, I think that would drive me bonkers. I’ve seen a tutorial where a blogger posted on how to cover the wood grain, but I am just not interested in that intensive of a process. I’m lazy. I made a few mock-ups to help me decide. Here we have white uppers and espresso lowers. And finally, espresso (java) cabinets. Which color should I pick? Sound off in the comments! 1.) I am not replacing countertops, backsplash or appliances…yet. Those will be phase 2 of our renovation, which will be in 2016, or maybe Christmas 2015 if Santa takes a hint. I’m wanting marble-esque quartz countertops that SPARKLE along with a marble backsplash. We currently have a VBB (very boring beige) solid surface countertop that is in good shape. 2.) I will not be replacing flooring until phase 3, which could be in 2017 (or never) at this point because this flooring also runs into the laundry room. It’s a big project to undertake. 3.) I love to be trendy, but I’m all about resale value and sweat equity. I want a return on my investment and time. What did you use to create the mock-ups? 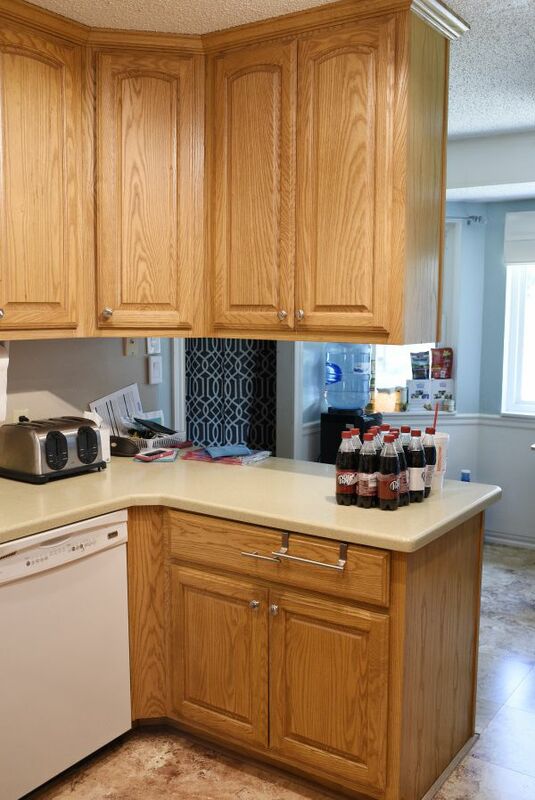 That would be really helpful for me to visualize my own kitchen plans, trying to figure out if I want to stain my oak cabinets a bit darker or paint them grey to go with black granite countertops. I used Photoshop. Have a great day! Hi Monica, I see all the work you've already tackled! 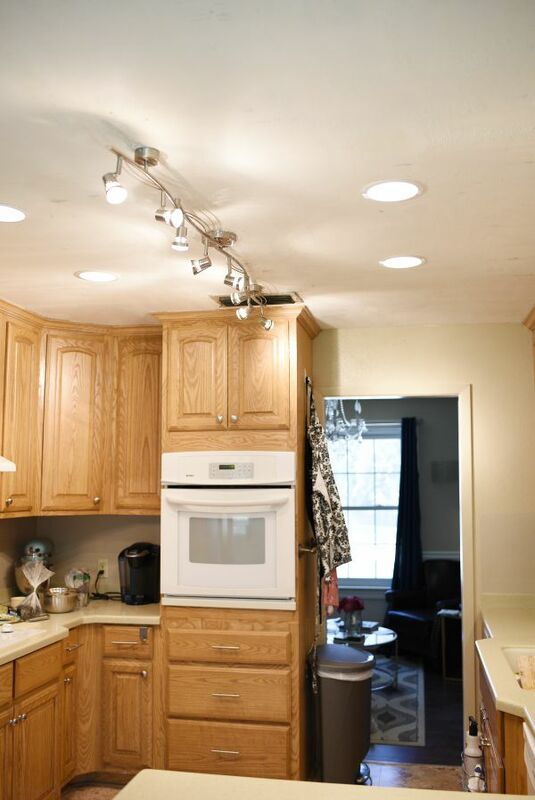 Wow, love the flat ceiling and how open it feels by just removing those cabinets! I love the contrasting colors. I would love grey for the lower cabinets. Anyhow, whichever way you go I think is going to be amazing! Looking forward to see more of your reno! I found your blog through the bathroom tutorial as well and now I am soooo excited about this kitchen!!! Just need to put my vote in for stain! I fell in love with the georgian cherry when I went to buy the stain in person but I also love the mahogany (I did my kitchen and guest bathroom, its a nice dark brown with subtle red undertones, but I did about 4 coats, less would be more red, less brown). If you do paint I can't recommend general finishes milk paint enough! I did one bathroom white and the paint is amazing. No prep work and it self-levels so no brush marks! They have a handful of colors but you can mix them together to get the right color. Also for resale- my realtor claims that white cabinets are 50-50 you either love them or hate them, but sellers know it's easier to make cabinets white than it is to undo the white. I've been thinking about trying the georgian cherry stain out to see if it's a smidge less dark than the java. I am so happy you had a great experience with that stain and the milk paint. I've never used milk paint, so I'm so fired up to use it on something. White, FOR SURE! White is classic and will let the light bounce around the living room. Also…it will compliment the countertops and flooring instead of fight against it. With white you'll be able to select those finishes when the time is right and you'll have more options…if you stain the cabinets dark, you'll limit yourself when it comes to the counters and flooring. I can't wait to see how it turns out! I do love white! I think you're definitely right about having more options if I go lighter versus darker. So many different things to consider. I am going to show my husband this. I like how you have your plan laid out, budget, and timeline. Thanks for sharing. I am glad you found it useful, Alba! 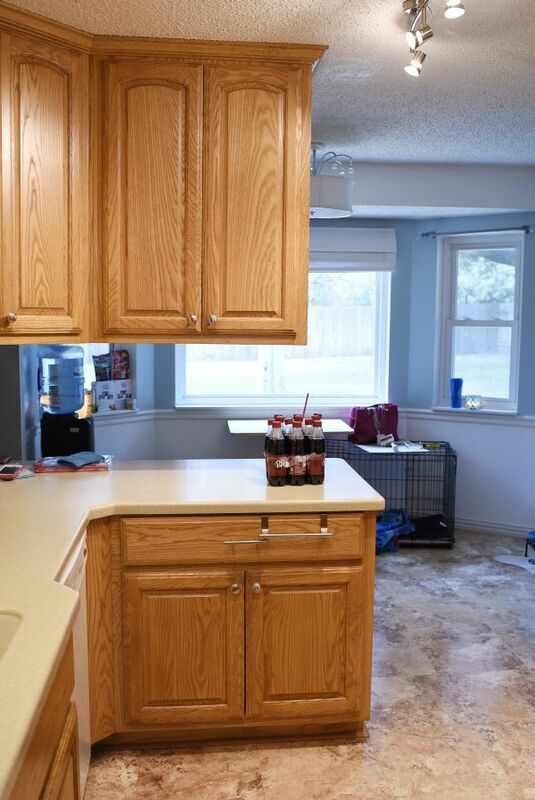 Great choice removing those cabinets! I would do a gray or off white color on the top cabinets, even a cresm, and a darker color on the bottom kcream with expresso would go well). Both colors should come from the marble. I think all one color is outdated, but the white and expresso are too harsh. Hope that helps! New counters, backsplash, floors and paint? That sounds exciting! Are you DIY-ing it all yourself? Backsplash DIY stuff scares me, well tiling in general scares me, but I hope to try it someday. Thanks so much for your input- it definitely gives me food for thought. Wow!!! This looks amazing! I cannot wait to get my own house so I can make changes that I want! Thanks for the future home inspo!!! I came for the java tutorial and will stay forever! I did my powder room in a cherry gel finish over ugly orange oak and love the results. I agree with Amy B, you have good taste, whatever you do will be amazing if it is something you do because you love it rather than if it is trendy. Also if you are dying for marble almost any deep color stain looks great. General Finishes has a wide variety of stains, maybe you just need to look at a few other options than Java. For the paint, maybe you need to look at some other neutral colors, tan, taupe or my favorite- grey. First choice? Stain- those are some really nice solid looking cabinets that are nice wood. Wood=$ when showing a house. 2nd? Paint in neutral shade to compliment your future marble. Last? 2 tone – too trendy not great for the long haul. These of course are just one more opinion from someone who looks every day at her pretty powder room and says "Thank you Monica!" Hi Carrie, I think you're right about the marble. Darker would definitely look better. I do have a few smaller samples of their other gel stains that I had forgotten about until your post. You hit the nail on the head– the cabinets are beautiful wood, so I'm thinking a stain is the way to go for a high end look. Painted wood just looks like…well, painted wood. :-/ So happy your powder is gorgeous! Comments like yours are what inspire me to keep writing tutorials and sharing my projects with everyone. I started following you last year when I was updating my 70s ranch for resale. I did follow your Java tutorial for my main bath vanity-came out fabulous, thank you;) I also removed overhead cabinets between kitchen and dining room and painted my cabinets…I could not decide between white and Java so I used my removed cabinet doors to try them out, leaning them against different areas to really see how it would look. I didn't really love either in real life! I wound up using a light tan and really loved the outcome…so do the new owners, sold to second people looking at my house on second day for full price!!! So my point is that you have good taste and it will work out if you trust your gut…and maybe you need to try some more colors since you haven't just jumped on one yet…maybe a grey? Or maybe if you try sample boards you will find one of your above choices really makes your heart sing…computer pics are great but nothing beats real life with lights, sun, etc…and with all the work involved you want to love it…good luck! Can't wait to see what you decide! Oh wow, Geez. At first, I thought I liked the all white but I kind of like the contrast of the dark against your white appliances. … Sorry, I'm of no help. haha. LOL! The white appliances will definitely be going sometime in the next 8-10 months, but I see your point. Plus, I love good contrast when decorating to give the eye something interesting to look at. Thanks, Melanie! xoxo! Ha! Its true I started following your blog after seeing your cabinet tutorial. I love how even your drop cloth is fabulous. My vote is for the espresso. 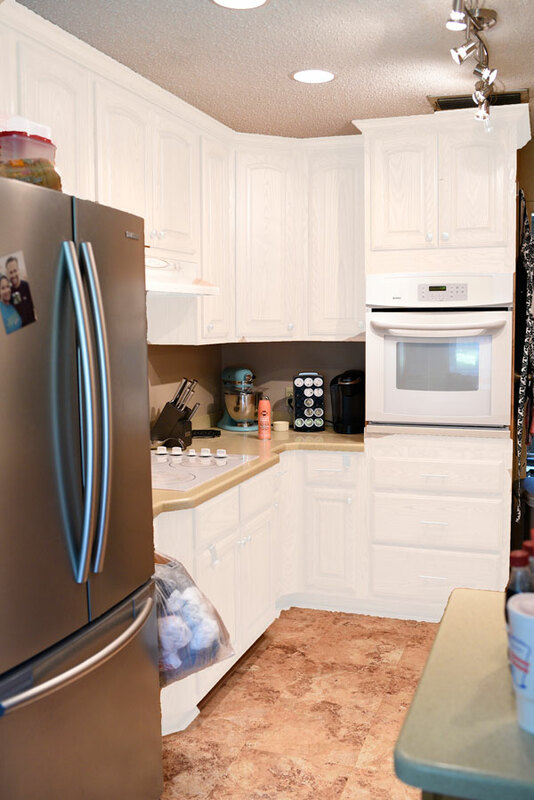 The white over time gets boring and trust me when it comes to resale…an all white kitchen blah. WHITE WHITE WHITE! Looks much larger! Wow, that looks like a ton of work! The ceiling still looks popcorn like. Congratulations on making your dreams come true! Marble counters are so pretty. We have granite throughout our home. In our kitchen, bathrooms & laundry sink. It can be difficult to keep a shine, but I heard that marble can be buffed with a car buffer to keep it's shine. I saw it on the Today show. Just thought I would give you that tip. The ceiling is flat I assure you. In the mock-ups it's still the popcorn ceiling since that was a good photo to use for the color mock-ups, but it's been scraped now. Thanks for the tip! Oh wow, lots of work, but you will love having the open look. I have seen several barstools that have a narrow profile that might work for your area, so look around. As for the cabinet color, if you want the marble look in the future, then paint your cabinets to go with that look, not what you have now. Can't wait to see what you do next. I am going to paint my bathroom for the 5th time today,so don't listen to me, obviously I can't decide either.